AMARILLO, Texas – You already know that Arizona’s Grand Canyon is the biggest canyon in the United States (227 miles long, 18 miles wide and up to a mile deep), but what’s the second largest? Unless you’re a Texan, you probably don’t know. 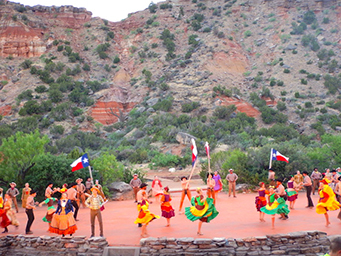 “TEXAS,” a full-of-action musical, makes the walls of Palo Duro Canyon sing with nightly performances in summer. Image by Tom Adkinson. It’s Palo Duro Canyon, a mighty demonstration of the power of water and erosion, in the otherwise flat territory of the West Texas plains. The not very exotically named Prairie Dog Town Fork of the Red River was the primary excavator of this spectacular chasm that is 120 miles long, 20 miles wide and 800 feet deep and exposes 250 million years of geology. Prehistoric residents hunted a now-extinct species of bison that stood eight feet tall and weighted more than 4,000 pounds here. Today, you can look for aoudads (Barbary sheep), coyotes, bobcats, feral hogs and scores of bird and lizard species as you explore Palo Duro Canyon State Park. The park is substantial, 28,000 acres, but it covers only 5 percent of the canyon. The state park acreage was ranch land until 1933, when the state of Texas bought 15,000 acres to start the park. Soon, the Civilian Conservation Corps began some backbreaking labor that benefits you today. Foremost is an eight-mile-long road the CCC built by hand. It takes you on a serpentine ride from the canyon rim to the bottom. Along the way is the El Coronado Lodge Visitor Center built of native stone so it blends nicely into this rocky landscape. It contains exhibits about the geology, biology and history of the canyon, as well as a tribute to the CCC. Another CCC leftover is some modest accommodations – seven rock cabins, three of which have running water. There also are six campgrounds in the park, along with 30 miles of trails for hiking, biking and horseback riding. Much more luxurious lodging is outside the park at Dove’s Rest Cabins. The scenery is gorgeous, with white layers of gypsum adding stripes of contrast to the red canyon walls, and the terrain is rugged to the max. It’s also accommodating habitat for western diamondback rattlesnakes. Rattlesnakes aside, park rangers say the park’s most dangerous aspect is the combination of heat and unthinking visitors. Water is the issue. Specifically, it is hikers who don’t carry enough water. On my recent visit, rangers’ radios crackled with transmissions about rescuing a woman who would not have been in trouble had she done as advised – stay hydrated. The CCC built the El Coronado Lodge Visitor Center in the 1930s. 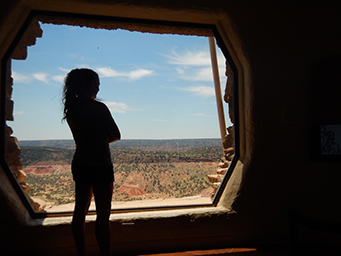 Today, it offers an air-conditioned spot to view part of Palo Duro Canyon. Image by Tom Adkinson. 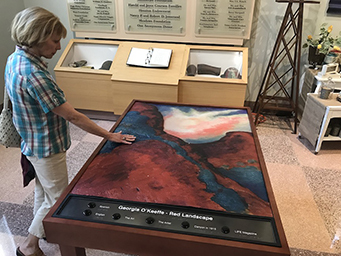 A three-dimensional representation of Georgia O’Keefe’s “Red Landscape” at the Panhandle-Plains Historical Museum gives the visually impaired a sense of Palo Duro Canyon. Image by Tom Adkinson. 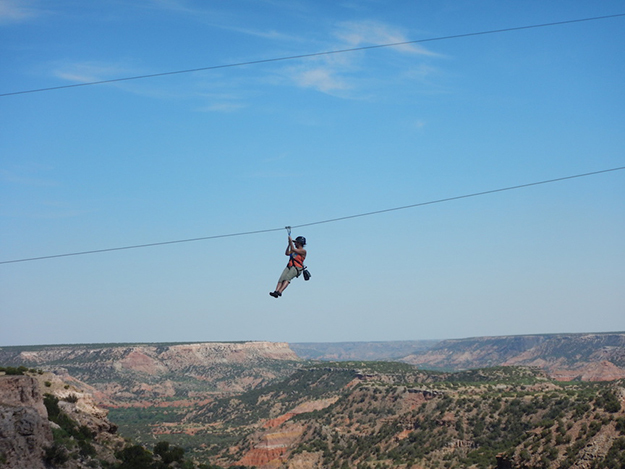 At the other end of the entertainment spectrum is a full-commitment ride at Palo Duro ZipLine Adventure Park. This private-sector thrill is just outside the state park’s entrance. Cables strung between carefully engineered towers offer a quarter-mile-long ride across a side canyon and provide you with a panoramic view of the main canyon. The ride is 587 feet above the canyon floor, but who’s counting? A more traditional form of Texas recreation is a trail ride, such as those with Cowgirls and Cowboys in the West at Los Cedros Ranch, a working cattle ranch covering 3,000 acres. It offers rides year round. 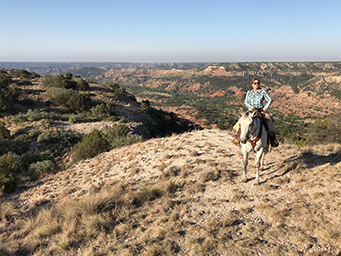 Owner Phyllis Nickum and her ranch hands ride with you posse-style, not in a nose-to-tail line, across the plains to the very rim of the canyon. 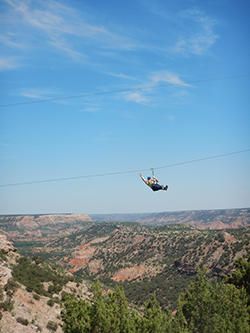 Those rides are exhilarating, offering views that prove why Palo Duro Canyon has impressed those who have peered into it for millennia, including artist Georgia O’Keeffe. An O’Keeffe painting, “Red Landscape,” is in the collection of the nearby Panhandle-Plains Historical Museum and can provide one of your memories of the second largest canyon in the country.